The VARIWALL Soundmaster 1000 Series is the tour de force of our operable wall line. This model's 102mm panel thickness gives the architect the optimum solution to very high acoustical and sound transmission needs. With a maximum height of up to 10 meters, the Soundmaster is capable of meeting (and exceeding) the most extreme requirements. 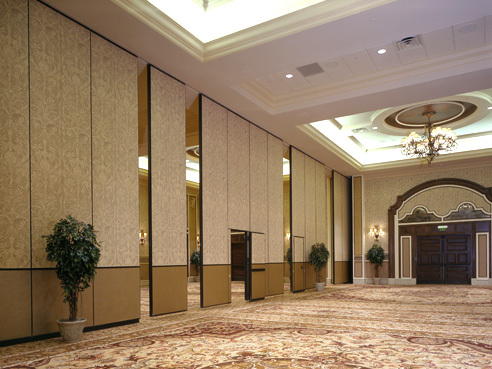 The VARIWALL® Soundmaster 1000® series is the “tour-de-force” of the VARIWALL® Operable Wall line. 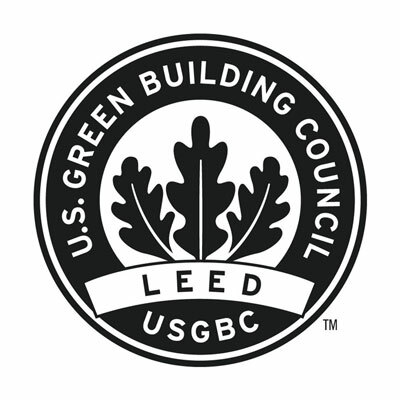 It has been installed in U.S. military defense installations surpassing their very stringent and demanding acoustical specifications. This model gives the designer the optimum solution to very high acoustical and sound transmission requirements in space planning. Where the space management is a premium and the problem of extreme and varied sound level use of adjacent rooms is present, such as a book seminar meeting on one side of the partition and a dance party on the other, always poses a booking and reservation challenge to hotel and convention center management. 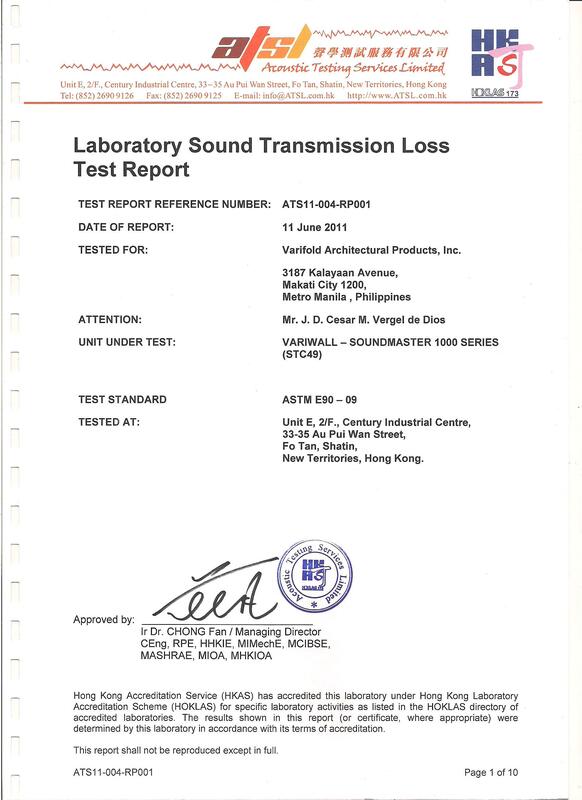 The Soundmaster 1000® series is available in seven Sound Transmission Class (STC) models: 43, 45, 47, 49, 51, 53 and 55. The panels have a load weight parameter from 45 kgs/m2 upto 75 kgs/m2. The nominal thickness of the panel is 102mm constructed with or without steel plates laminated by using a polymer latex sound absorbing adhesive on a 12mm gypsum board or MDF. This engineered panel floats on an EVA polyfoam tape for added sound absorption. A high density acoustical infill of 60kg/m2 up to 80kg/m2 is provided for optimal sound absorption. Varifold's VARIWALL operable wall line has been certified by a HOKLAS (Hong Kong Laboratory Accreditation Scheme) accredited laboratory. 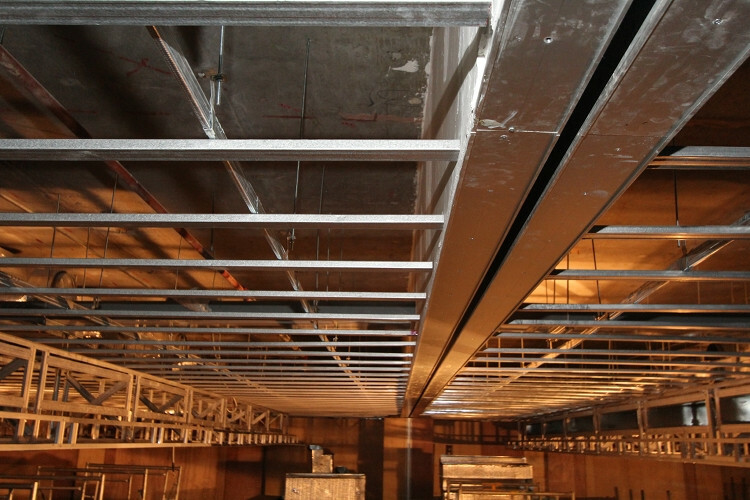 The Soundmaster 1000® also features VARIWALL®’s advanced track and carrier system. The panel trims are made of anodized architectural grade aluminum alloy 6063 T6. The panel meeting stile is designed with an ASTRAGAL shaped connection with a deep nesting, co extruded rigid polyvinyl bullnose with flexible seals cored with a soft polyfoam acoustical insulation. This series can reach up to 10 meters in height without the necessity of a major panel frame structure retrofitting. 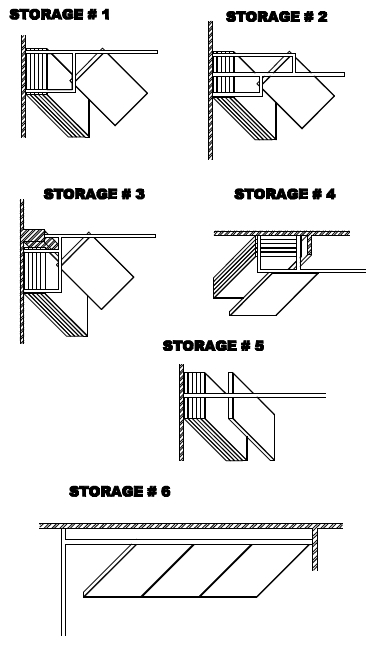 The partition width span is unlimited. The panel width can be specified from 0.6m upto 1.2m. Limited warranty of five years for the rail tracks and carriers. Three years on panels and mechanical parts, and one year on labor. Limited warranty shall not include panel finish, freight, shipping, and transportation cost. This warranty shall be against defects in materials or workmanship of manufacturer’s products. Individual panels shall be nominally 102 mm thick. The panel is 10mm gypsum boards laminated with a 3mm MDF skin for impact and puncture resistance and sheathed with the appropriate gauge of galvanized steel sheet for sound barrier. It shall be installed in a floating manner on the panel frame for optimum sound isolation. There shall be no screw, bolt, or adhesive to be used to attach the panel onto the frame. The panel vertical and horizontal rails shall be made of anodized architectural grade aluminum alloy 6063 T6. It shall be top supported by factory fabricated steel tubular carrier weldments. Vertical sound seals shall be deep nesting co-extruded rigid PVC bullnose with flexible seals cored with soft polyfoam acoustical insulation. The top and bottom horizontal seals are fully encapsulated aluminum carrier seals equipped with eight layers of PVC sweep sound seals operated by a square spindle and cam shaft mechanism. Both top and bottom horizontal seals shall be operated simultaneously with a heavy duty spring loaded, single action 180 degree cranking mechanism. Mechanical seals shall provide a force at the top and bottom of panel in order to seal off any gaps and afford extra lateral stability for the panel. There are three types of track available, the omni directional Type 1000 and Type 1500 and the center suspension Type 900. The tracks shall be anodized aluminum architectural grade alloy 6063 T6 annealed. Track intersections, escapements and storage shall be made of the same type and aluminum grade as the main rail. There are three types of carrier systems available, the Type 1000 which is a dual precision ball bearing with moulded in place Delrin tires and has a 455 kgs. 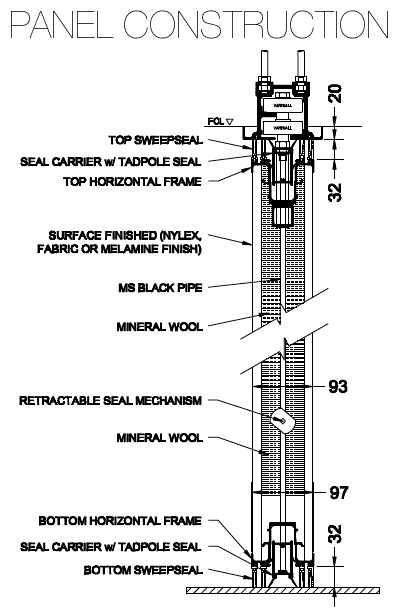 load capacity for omni directional track. The Type 1500 carrier is similar to the Type 1000 except that it has a load capacity of 680 kgs. Panels in an omni directional track shall be able to traverse X, T or L intersections. The other carrier type is Type 900 which is used for the Track Type 900. The Carrier Type 900 has four precision ball bearing with moulded in place polymer tires and has a 409 kgs. load capacity. The highly precision aluminum track and steel ball bearing with polymer tires provides a smooth and quiet panel operation. A telescopic Lever Closure Panel is used as the trail panel to close off gap and provide tight sound insulation and lateral panel stability. The lever closure is actuated by a sprocket on an industrial duty linear gear mechanism, running along 3 nylon tires with ball bearing assembly. There are two types of Lead Closure Panel available in the Soundmaster 1000 series, these are: the Bulb Seal to Wall Receptacle and the optional Vertical Stile to Wall Jamb. The Variwall® Soundmaster 1000® series offers six different Panel Stacking Systems that covers all possible project requirements. These can be configured in several combinations to provide even more options. - Bare Finish: MDF, Plyboard, Gypsum Board. - Whiteboards, marker boards, tack boards maybe specified.